CHS’ Nick Brent wedges through to the basket as the Vols beat Burney 60-43 on Dec. 8. The Chester High Vols played the Westwood High Lumberjacks on Dec. 20, just before the holiday, winning 61-24. Action on the court leapt off to an exciting start as the Volcanoes put 23 points on the scoreboard in the first quarter, the biggest splash period of the game. The Chester boys followed up with a 14-point second quarter and 18 points in the third. Both teams picked up the defense in the fourth quarter as Chester added just 6 points allowing only 2 points for Westwood in the final quarter of the standoff. Stats for hot Volcano action during the annual Marty Passaglia Invitational 2018 Tournament in Hamilton from Dec. 11 through 15 are in. The first game was against rival Trojans and ended in a victory for Quincy 65-57. The Volcanoes started off the first period with just 6 points to the Trojan 19. A closer 9 points in the second quarter to the QHS 13 marked a shift, but boy did things change after the half! CHS head coach Aaron Hardesty must have had some enlightening words for the boys as they returned with fire and outscored the Trojans in both quarters and with the highest scoring quarters of the game. Racking up 21 points in both the third and fourth quarters, the Volcanoes really brought on the heat. Unfortunately, it wasn’t enough to burn through the early Trojan surge to take the win, but it laid the ground for what was to follow. Junior Devon Dye scored 23 points. 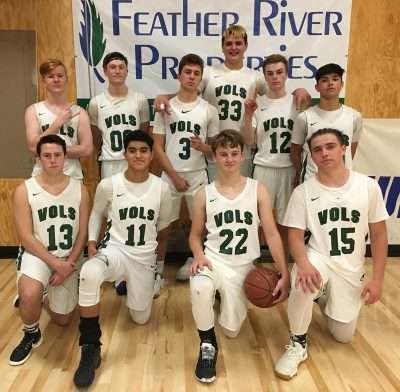 Juniors Jeremiah Mosley and Hunter Snyder each scored 9 points while Kameron Stelzriede added 6 points and Eric Pacheco and Nick Brent dropped in 4. Mosley made his 9 points in three 3-pointers and Snyder also landed a trio of 3-pointers. Stelzriede and Pacheco each sunk a 3-pointer. Devon Dye planted under the basket to pick up 10 rebounds. Nick Brent grabbed six, Mosley five and Snyder four. 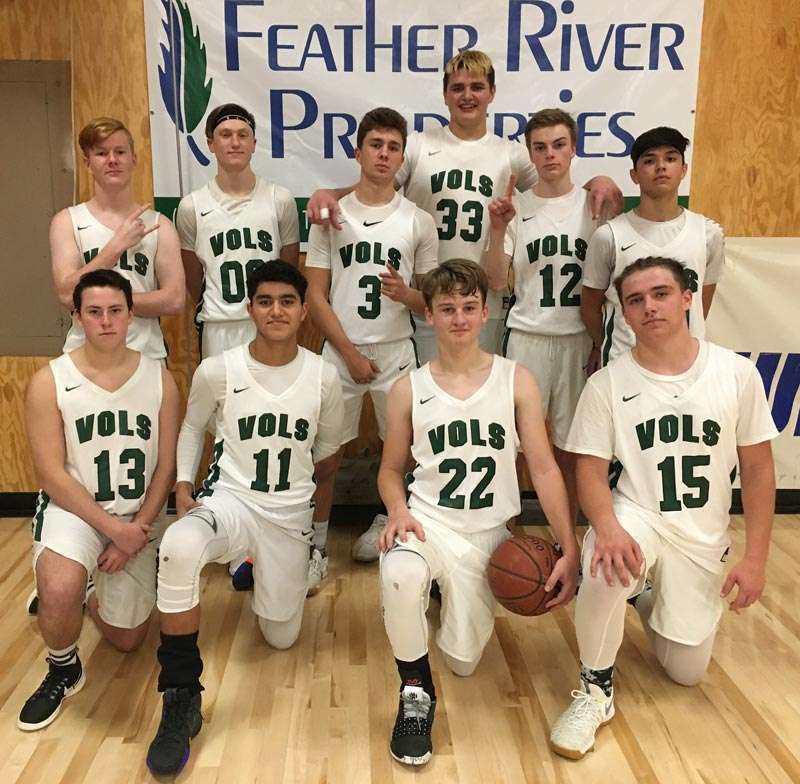 Also picking up rebounds were Justin Contreras, Stelzriede and Pacheco, which rounds up to every member of the Volcano team doing their part to clean up under the basket. Stelzriede moved fast with nine turnovers in the game. Snyder and Dye had four each and again, each member of the CHS team instigated a turnover facing the Quincy Trojans. Four personal fouls were credited to Dye, three to Stelzriede and two to Hunter Snyder. The Etna Lions were next to come up against the fired up Volcanoes and lost to CHS 48-42. It was quite a game as the Volcanoes came out by a single point in the first quarter to show how close the game would be, 12-11. The second quarter, CHS held the lead 21-16. After the half, the Lions roared and outscored the Vols 15 to 10 to tie up the score 31-31 at the end of the third quarter. The Vols held tight and put 6 points more than the Lions up on the board in the final period. Whew! Devon Dye pulled out all the stops and when he gets going there is no stopping him. He was responsible for 26 of the Volcano 48 winning points and hit 63 percent of his shots. Stelzriede put up 8 points and Pacheco added 5. All the members of the Volcano team scored against the Lions. Dye put in a pair of 3-pointers and Pacheco scored with one. From the free throw line, Dye scored with four, Stelzriede with two and Mosley sunk one. In the rebound department, Dye used his height to help him pick up 18 rebounds, 12 for defense. Mosley picked up a total of five, Pacheco four, while Nick Brent, Kurt Stiarwalt, Stelzriede and Hunter Snyder also picked up rebounds for the Volcanoes. Stelzriede picked up three personal fouls, Dye two and Snyder was credited with one. With one win and one loss racked up, the Chester boys were poised to face the hosting Hamilton Braves in their final match. The Braves had an identically inverted record of one win and one loss beating Quincy Trojans 65-42, but losing to the Etna Lions 56-44. The game ended with a dramatic OT finish for the Chester Volcanoes 63-56. This is how the game played out: CHS launched out in the first quarter 19-7. The Braves retaliated, outscoring the Vols only to trail 24-18. The Braves kept up the effort after the half to again outscore the Vols, but fell short of the lead by the end of the third quarter, 37-35. 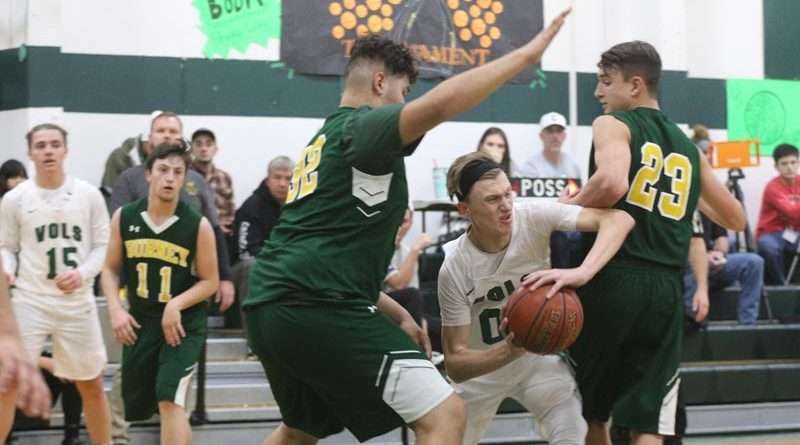 The Braves were growing stronger as the game continued and in the fourth quarter when they bested Chester by two points … that tied things up at 54-54. The Volcanoes fired all the burners as they scorched the scoreboard in OT, adding 9 winning points to the Brave’s 2. Devon Dye has improved his success with the basket tremendously since last season, utilizing all he’s got for CHS. Dye is assisted greatly by his teammates getting him the ball under the basket and his own skills picking up offensive rebounds, but there is no getting around the abundant points Dye is putting on the CHS scoreboard, 34 against Hamilton. Stelzriede added 8 points; Snyder 7, including a 3-pointer; Eric Pacheco 6, with two 3-pointers; Nick Brent 5; and Mosley contributed 3 points. Dye landed six of his eight free throws; Snyder scored two out of two. Picking up offensive rebounds was Dye with six, Brent and Mosley with two each, and Isaiah Estacio with one. Taking control with defensive rebounds was Dye with 15. Mosley and Pacheco each picked up five, Snyder four and Estacio and Stelzriede each gathered a pair each. While winning that final challenge, Snyder and Kurt Stiarwalt picked up a personal foul, Stelzriede and Pacheco earned two, and Dye was credited with three.